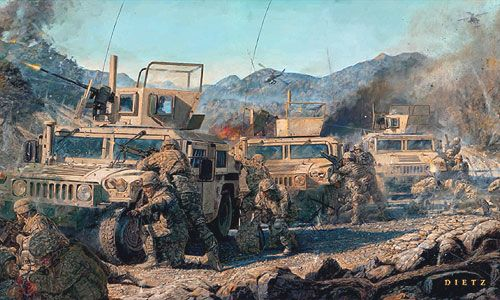 James Dietz Handsigned and Numbered Limited Edition Print:"Counter Attack"
About the Artist: First Rock Paratroopers maneuver against Taliban and Foreign Fighters after they are engaged in a far ambush while moving through a dry river bed in Eastern Paktika province. All the while gunners and our brave soldiers deliver withering return fire; they are fixing the enemy position, setting up a support by fire with 60mm mortars to suppress with high explosive rounds, denying the weary enemy escape routes with the support of attack aviation and finishing the enemy force with close air support JDAM strikes. The mountainous and canalizing terrain Eastern Paktika Province favors the ambusher, a fact that the Taliban used to the best of their ability. Nevertheless, precise and efficient coordination with air and indirect fire support, superior physical stamina and discipline among our individual paratroopers, and constant training meant that during contact, Task Force Eagle and 1-503rd Airborne, always maintained decisive advantage.